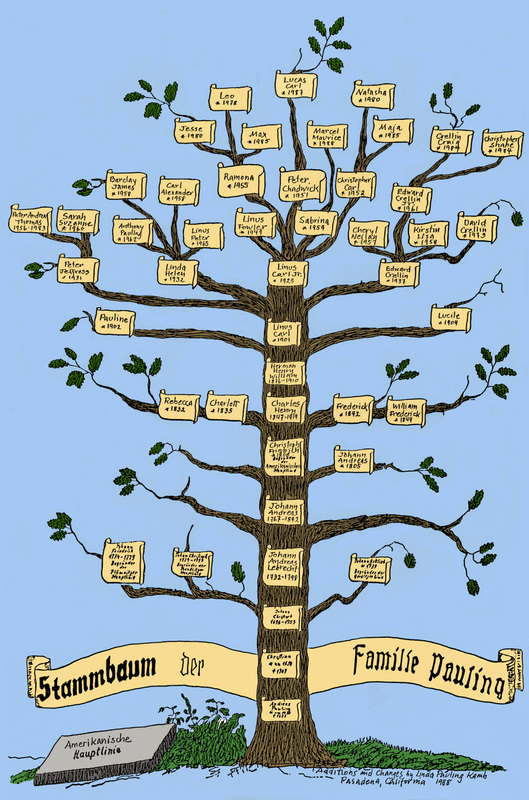 The Pauling family tree. Certain annotations courtesy of Linda Pauling Kamb. 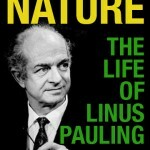 Linus Pauling’s earliest known ancestor was Andreas Pauling, born ca. 1630. Records indicate that Andreas’ grandson, Johann Christoph Pauling, married and started a family in Preusslitz, Prussia. There the Paulings remained for at least two generations, until Johann Andreas Pauling (perhaps the grandson of Johann Christoph) move to Golbitz, in what is now western Germany. In 1842 a son of Johann Andreas’, Christoph Friedrich (born 1808), immigrated to the United States with his wife and two daughters. A son, Frederick, was born during the family’s passage across the Atlantic, and two additional sons, William Frederick and Charles Henry (whom everyone called “Carl”), were born in the U. S. The Paulings settled as farmers in Concordia, Missouri, though Christoph Friedrich and all three of his sons would eventually fight on behalf of the Union during the American Civil War. In 1868 Carl Pauling married Adelheit Blanken and the couple started a family of their own. Carl and Adelheit’s fourth child, Herman Henry William (born 1876), is Linus Pauling’s father. After a brief long-distance courtship, Herman and Belle married on May 27, 1900. Though Herman would die just ten years later — suddenly, at age 34, of a perforated ulcer and peritonitis — he and Belle would have three children: Linus Carl, born February 28, 1901; Pauline Darling, born August 7, 1902; and Frances Lucile, born January 1, 1904. 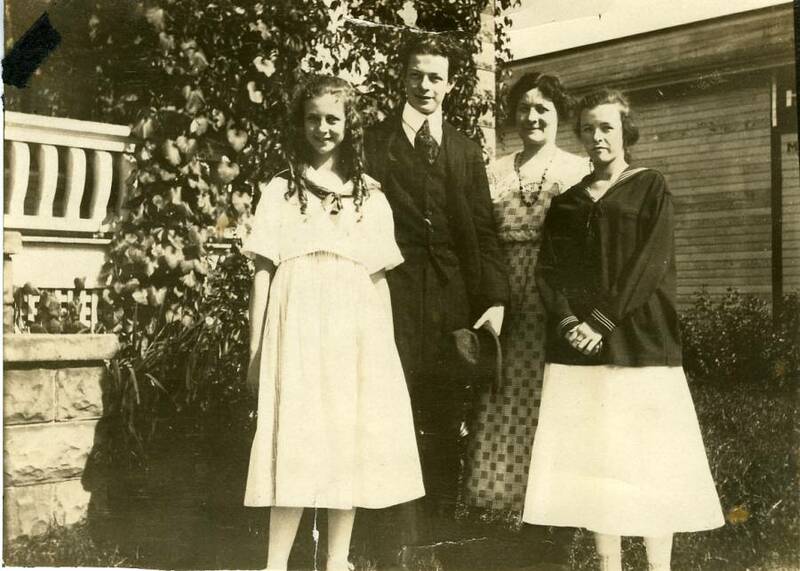 Lucile, Linus, Belle and Pauline Pauling, Portland, Oregon, 1916. 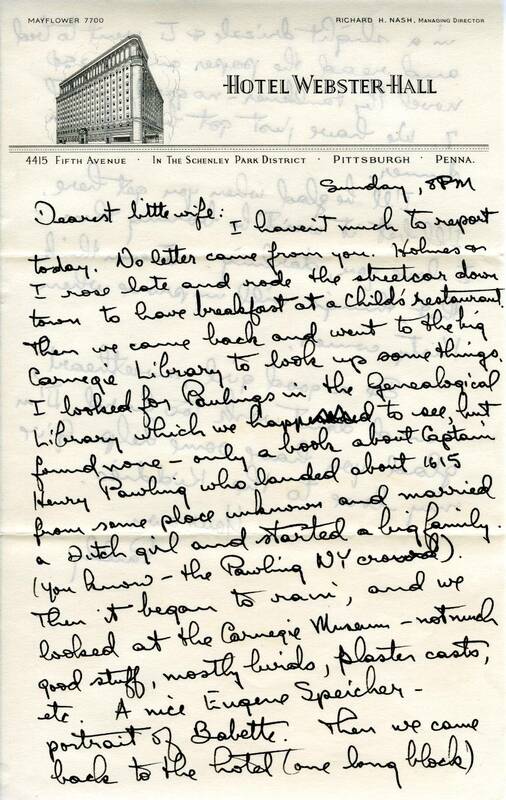 Page 1 of a letter sent by Linus Pauling to Ava Helen Pauling, August 16, 1942. Health and longevity were not necessarily in Linus, Pauline and Lucile’s DNA; their father’s life was quite short and Belle’s not much longer — she died at age 45 of pernicious anemia. Nonetheless, all three lived well into old age: Lucile died at age 88 on January 18, 1992; Linus died at age 93 on August 19, 1994; and Pauline, a colorful woman who married four times (the last to Linus’s boyhood friend and Caltech first-year roommate, catalysis chemist Paul Emmett), lived to the age of 101, passing on October 19, 2003. 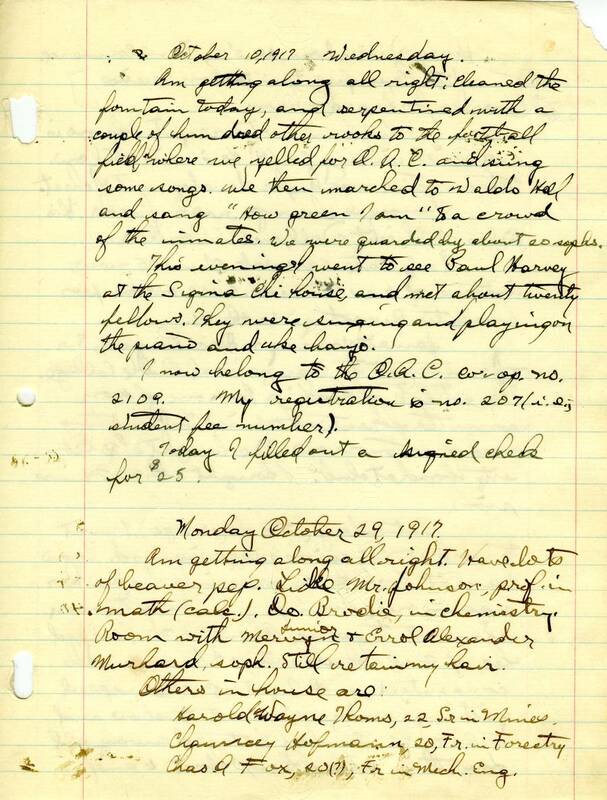 Linus Pauling’s papers contain ample documentation of his family geneology. While much of this was compiled by other family members or the various biographers who have written on his life, Pauling himself pretty clearly maintained a long-standing interest in his roots. 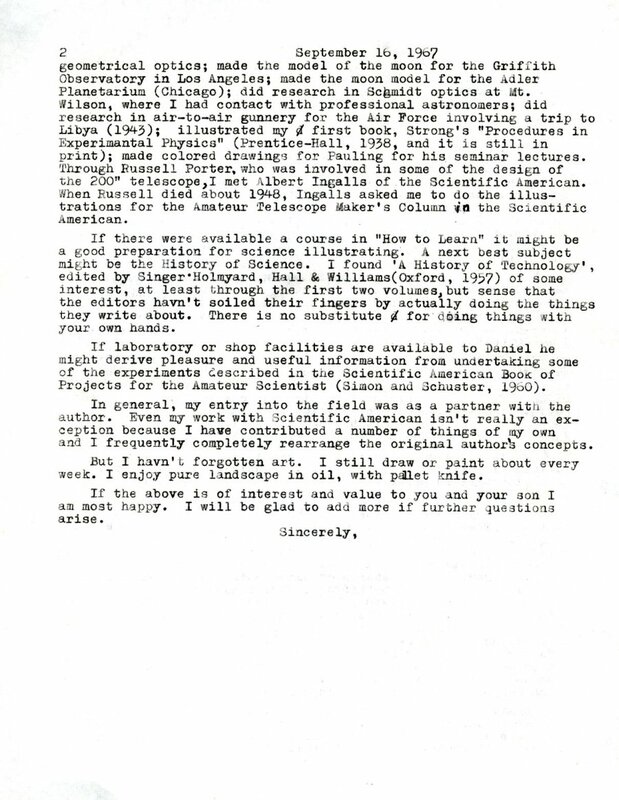 Page one of a letter sent by Linus to Ava Helen in August 1942 (reproduced below) is an early example of the geneological work that might fairly have been termed a minor hobby — or, at least, intellectual interest — of Pauling’s throughout his long and illustrious life. Pastel drawing of a Tantalum Halide cluster ion. 1964. 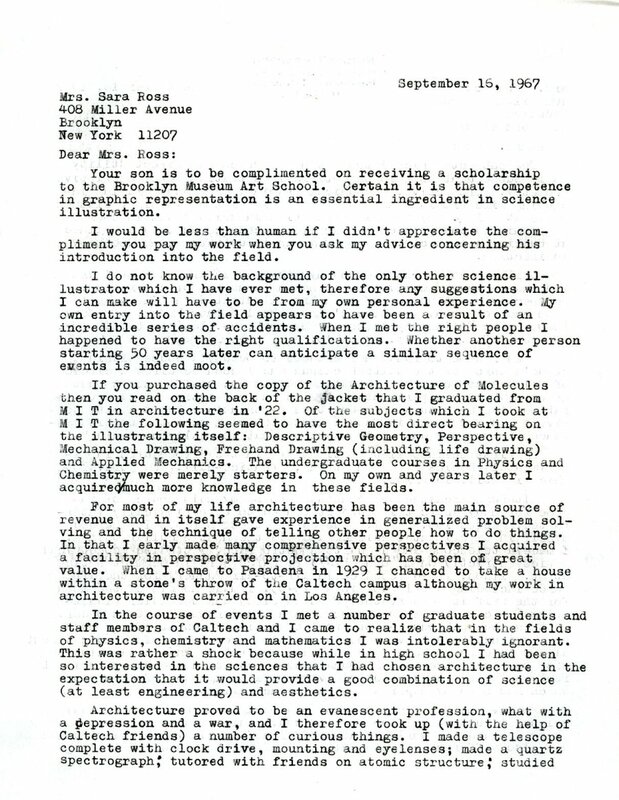 Linus Pauling may have learned about Roger Hayward and his “drafting” talent in the early 1930s. Hayward had designed several new architectural structures in the LA area (the Doheny Library and the Los Angeles Stock Exchange, for example) many of which had been prominently displayed in the local papers. With the onset of the Depression, Hayward was looking for work. At the same time, Pauling was going “great guns” in determining new molecular structures, and was likewise building models for use in classes at Caltech. Hayward possessed the ability to visualize these structures in three dimensions, to illustrate these structures in a 3-D perspective and to make models of the structures. 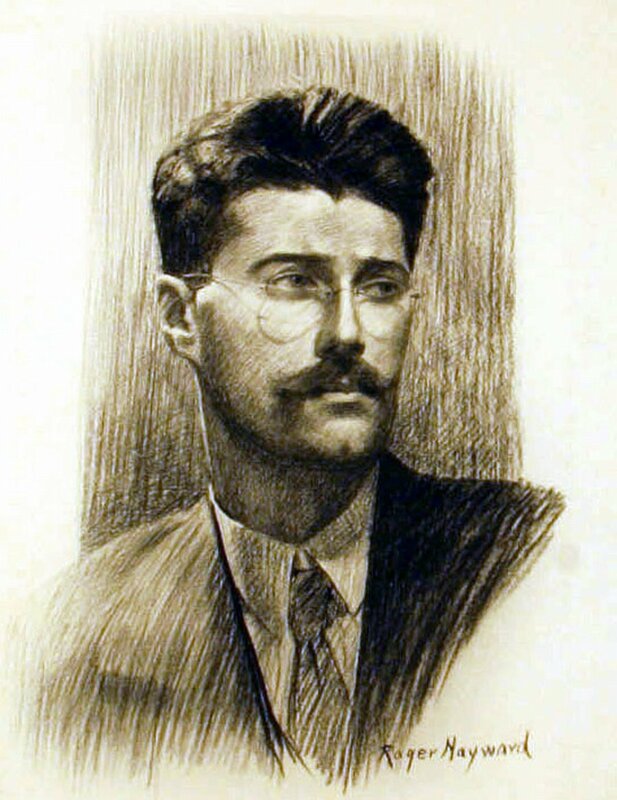 Initially Pauling may have viewed Roger only as a “draftsman”, albeit a particularly talented one. Despite their proximity, Pauling and Hayward communicated mostly by letter. One reason for this was that Pauling was always busy or traveling, thus making face-to-face meetings difficult to arrange. Hayward, on occasion, would go to Caltech to pick up sketches or notes, but otherwise the collaborators did not often meet in person. 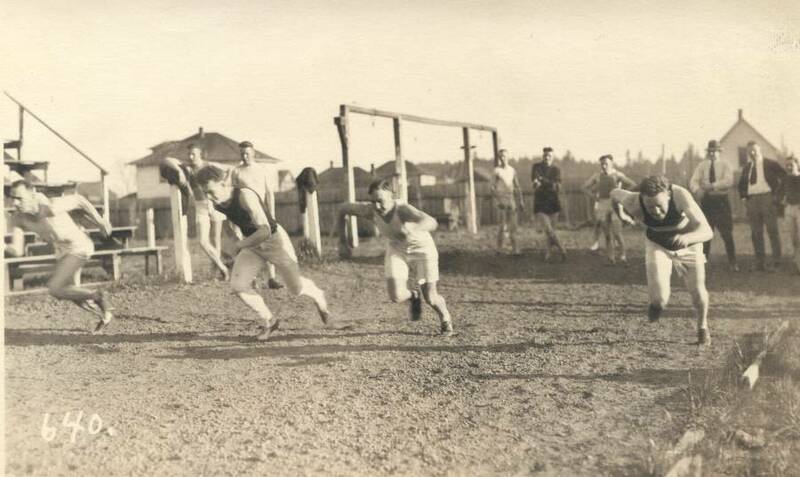 Fundamentally, the two men were consumed with rather different lifestyles: Pauling was usually in a rush and often did not have enough time to follow all of his pursuits. On the other hand, Hayward, at least upon his departure from the Lunden partnership, had time to do as he wished, and to ponder the many diverse subjects that interested him. This exchange changed Pauling’s attitude towards Hayward in that he now had complete confidence in Roger’s abilities properly illustrate molecules and, indeed, to act as a check on Pauling’s calculations. Furthermore, Pauling considered Hayward to be a scientific colleague, as evidenced by the publication of “The Structure of Protein Molecules,” a 1954 Scientific American paper in which, for the first time, Hayward is included as a co-author. The Pauling-Hayward relationship further evolved when a German magazine raised Pauling’s ire by copying the Scientific American article without permission, altered its illustrations and deleting Hayward as a co-author. The above exchange is also suggestive of the difference in the personalities of the two men. Pauling was a highly-driven person working in the competitive field of molecular structure determination. Hayward, on the other hand, was motivated primarily by his passion for artistic merit and out of curiosity. Perhaps the climax of the Pauling-Hayward relationship — and, indeed, a happy one — was the creation of their best-seller, The Architecture of Molecules, published in 1964. The development of this book, initially titled Molecular Architecture, can be credited to the visions of William Freeman, Stan Schaefer, Harry Marks, Linus Pauling and Roger Hayward. By 1964, Roger had completed a series of illustrations for Pauling’s College Chemistry and the Pauling-Hayward team had also worked well together on a number of professional papers. The time seemed right to collate all of this information into an artistic/scientific book written for the general public. Pastel drawing of Camphor. 1964. Pastel drawing of Ethylene. 1964. Pastel drawing of Hexamethylenetertramine. 1964. The bulk of the communications regarding this project, exchanged mostly between Harry Mark and Roger Hayward, reveal an air of excitement and fun. Roger planned to draw with pastels, and described in great detail the paper, textures, layouts and, most importantly, colors that he hoped to feature. A four-color press was a must for this publication, as the drawings would not include a white margin, thus lending more depth to the molecular structures. Use of pastels also afforded a certain amount of needed haziness to the diagrams, as the precise bonding of atoms was not entirely clear. (In this Roger made great use of the tutorials in atomic physics he had previously received from R.M.Langer). The myriad details that Roger forwards include specific colors to be used and their Munsell color notations. Lighting effects for each diagram were discussed at length between Roger and Harry Mark. When a diagram was complete, Pauling would review it, approve it, and then write an accompanying text. The communications regarding production end with a September 21, 1964 letter in Pauling confirms the change in title of the book to The Architecture of Molecules and notes his concern with publication delays, hoping for Christmas sales and revenue. Annotated pencil sketch of the structure of ice. 1964. Pastel drawing of Methane. 1964. Pastel drawing of Sodium Chloride. 1964. A few notes regarding the book: On January 19, 1965, Roger Hayward wrote to Harry Marks requesting return of the color slides of the plates. To date these slides have not been found. The book itself received high praise as a work of art. The emphasis in every review is on the drawings, perhaps because this was among the first publications where art and science are so thoroughly blended. The book has been translated into Spanish, German and Japanese among other languages. This was also the last major joint publication between Linus Pauling and Roger Hayward. The collaborators did, however, remain professional friends as suggested by the text of Pauling’s lecture at Berkeley in 1976, in which he refers to Roger Hayward as a scientist, and a 1976 letter from Hayward to his cousin Marjorie Widdop, in which Roger states that he and Pauling have been friends and have worked together for over 40 years. For more on Roger Hayward please see his Key Participants page on the website Linus Pauling and the Nature of the Chemical Bond: A Documentary History, or click here. Architecture took off after the war, and in 1949 Roger Hayward became a partner in the firm Lunden, Hayward and O’Connor. This partnership undertook many large jobs in the greater Los Angeles area, including the Hyperion treatment plant, many schools, an addition to Good Samaritan Hospital (which ultimately included a patent for a baby-tending stand), the Los Angeles City Health Building and the Temple Israel of Hollywood. Roger gave particular thought and energy to the design of the front door of the temple. The firm broke up in 1957, perhaps due to Roger’s influence: he did not like the commute to downtown LA, greatly preferring instead to work in the hobbery in Pasadena and to spend more time on artistic projects. In addition his asthma became chronic and required a clean air environment as well as a daily shot of ACTH. As a result of his departure from the architecture firm, Roger drew more; exhibited in various locales, including the Hatfield Galleries; and gave talks on art, with a particular emphasis on color and color perception in illustrations. He also became involved in the Ebell Art Salon in LA and was active in, and for a term was President of, the Pasadena Art Association. Roger’s painting was now almost entirely in watercolor, though later he began to favor pastels and crayons. He became enchanted with the American West and he, Betty and their little schnauzer “Gnawbert” (perhaps named after Norbert Weiner at MIT?) would partake in art/fun trips to the desert most every year. Roger mainly painted at home in the hobbery, maintaining a mental vision of what he saw on these trips. In 1956, Roger was hired as a consultant to Disney Productions for purposes of providing “corrections” to their moon model. 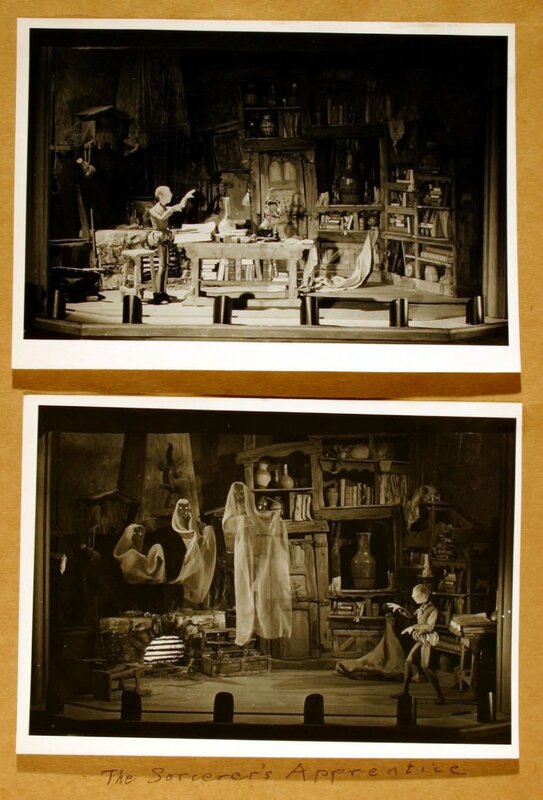 The Disney model had been constructed from casts of the Griffith and Adler models, and in the process the Disney materials had been altered. Figure 16. 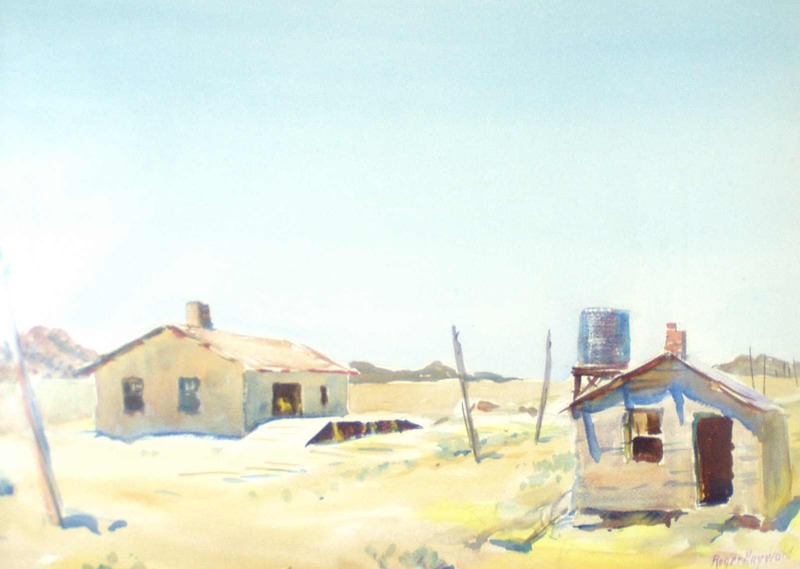 Watercolor of a deserted ranch (Kramer collection). In 1958, Roger signed a ten year contract — with an annual retainer and add-on commissions — to illustrate solely for W.H. Freeman Publishers.This contract afforded Roger a great deal of freedom and financial stability. Numerous jobs arose out of this agreement, ranging from mineralogy to organic chemistry to mechanics and electronics books.Importantly, the Freeman contract led to the well-received Pauling and Hayward publication, The Architecture of Molecules (see Installment Four of this series). Despite the security that the Freeman deal provided, the arrangement eventually fizzled as Roger tired of the tedium of “drafting,” and often found himself disagreeing with authors who wanted “clean” diagrams.Roger wanted to “illustrate.”In addition, Roger’s asthma and weakening eyesight made “drafting” more difficult.He therefore reverted to a looser retainer agreement with Freeman, which allowed him to pursue opportunities outside of the publishing house. Roger was always interested in the meaning and interpretation of art, vision, and especially color. As his vision started to fail, he resigned from professional work and started to tinker. One interest was the development of drawings and articles for the Worm Runners Digest, for which Roger authored many publications. The first and perhaps best-known is 1968’s “Blivets-Research and Development” (vol X, no 2) in which he constructs a number of pleasing but impossible diagrams. (Fig. 6 of this issue has been reproduced in a number of other publications. ) “Blivets — the Makings” (Vol XII, no 2, 1970-1971) was probably written in response to the large correspondence he received concerning the construction of these “impossible” figures. One fun contribution was “Cupidons — The Survival of the Flittest” (Vol X1, no 2, 1969). A more serious submission was entitled “The Jigsaw Puzzle and the Inventive Mind” (vol X11, no 1 1969), an essay on memory, imagination and inventiveness. Fun again came in the July 1971 issue (vol XIII, no 1), “Flower Bed Bugs,””Livits” in the 1971 (Vol XIII, no 2) issue, and “Digititums” in the vol XIX, no 2 issue of 1977. Color perception and meaning were an area of intense study by Roger. He had an artist’s basic sense of color, but was also interested in how an individual considers color, especially with respect to black-and-white. One psychological study that he proposed focused on the spinning of a circular wheel with black-and-white markings on a phonograph table and subsequent observations on the development of color. Roger studied the eye’s perception of color and led many discussions with Caltech academics and art groups. These studies were important in determining the color palette in The Architecture of Molecules. Roger also worked on stereo effects (J Opt Soc Amer. vol 56, 255-256) derived from planar figures, enhancing techniques now commonly used to show stereo views of molecules. The 1970s saw a marked decrease in Roger’s ability to continue to draw. His eyesight worsened, and in 1974 he was compelled to give up his work on the Amateur Scientist column. He obtained a large orator style typewriter to send letters, and often Betty would have to retype them. One small token of good-fortune was his movement from watercolor drawings to pastels and crayons in the 1950s, which allowed him to continue to sketch through the mid-1970s. His common pastel choice was silver and white on a black background, or vice versa. In 1973, Roger and Betty moved to Merced, California, so as to enlist the support of Betty’s half-sister. Roger was nearly blind and was limited to mostly drawing in black and white, while Betty continued to design original patterns and to weave. Since Roger’s eyesight was very poor, Betty spent a great deal of time reading out loud and typing his letters. In 1975, he was hospitalized for an extensive period of time, and he returned home quite weakened. He died at home in 1979. For more on Roger Hayward, click here. Figure 12. Zodiac watercolor by Roger Hayward. 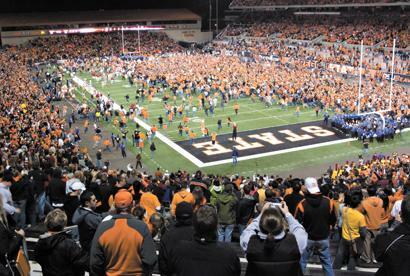 At the prodding of S.E. Lunden, a classmate and colleague at Cram and Ferguson, Roger left Boston for Los Angeles for work as an associate and chief designer for Lunden and Associates. Lunden had landed two major jobs, the USC Doheny Library and the LA stock exchange. Much of the exterior of the Doheny library (see http://www.publicartinla.com/USCArt/Doheny/hayward/ ) and the stock exchange (see http://www.you-are-here.com/downtown/stock_exchange.html) were designed by Roger. In particular, he was honored for the art work over the main entrance to Doheny. The glass mosaic of the Zodiac over the entry to the library is from his watercolor. In 1933 he received an award from the American Institute of Architects for this design. The massive and well-balanced entry doors to the exchange were his ideas as well. As the 1930s moved forward, the Depression hit the region hard and there was no new architectural work for some time. As a result, Roger became a “jack-of-all-trades” in order to stay afloat. He, Betty and his brother, Julian, started making puppets and putting on puppet shows under the name BEROJU (Betty, Roger, Julian) both at their house and at Caltech’s new Athenaeum club. Puppetry was an extension of Roger’s early days back in New Hampshire when his family would create plays by making masks and acting out different roles. Figure 13. 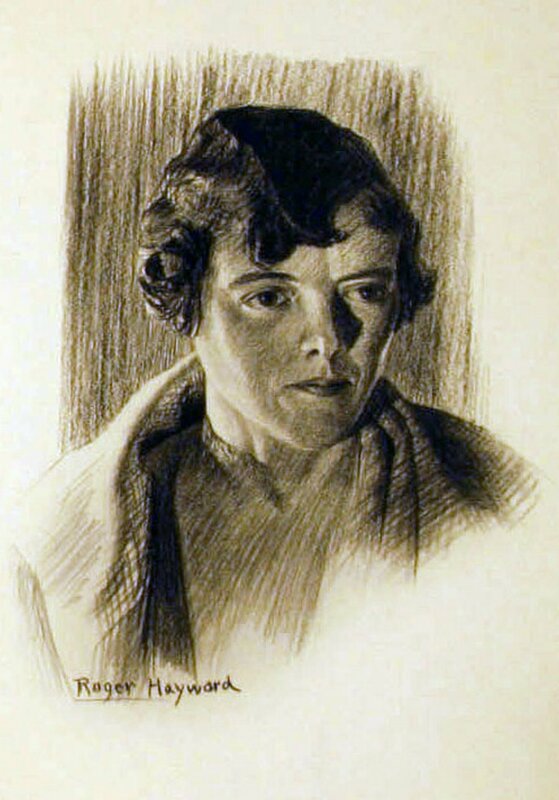 Elizabeth in 1935. Roger and Betty lived on East Walnut St., about 8 blocks from Caltech, and it was natural to make contact and become friends with faculty. Roger developed numerous associations with the professors in his neighborhood, including John Strong of the Physics department and architect/astronomer Russell Porter. Benefiting from their introductions, Roger negotiated a contract for a moon model at the Griffith Planetarium on a scale of 50 feet to the diameter of the moon. This work attracted international press for Roger as the “man in the moon.” Later he was commissioned to make a smaller (6 feet) but complete model at the Adler planetarium in Chicago. Figure 14. 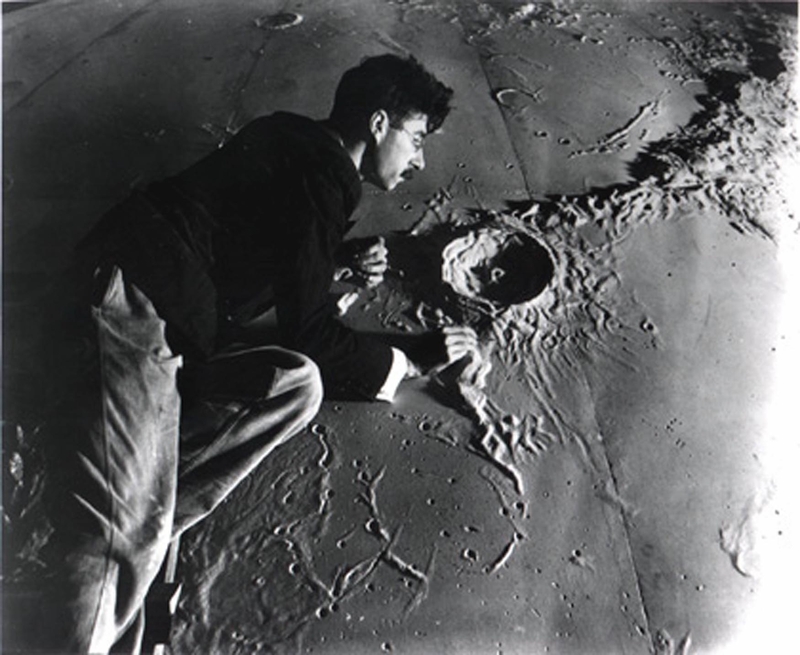 Roger working on the Griffith model of the moon. (Los Angeles Public Library photograph, Security National Bank Collection). To assist, he swapped a watercolor painting with physicist R.M. Langer in exchange for tutorials on atomic theory. 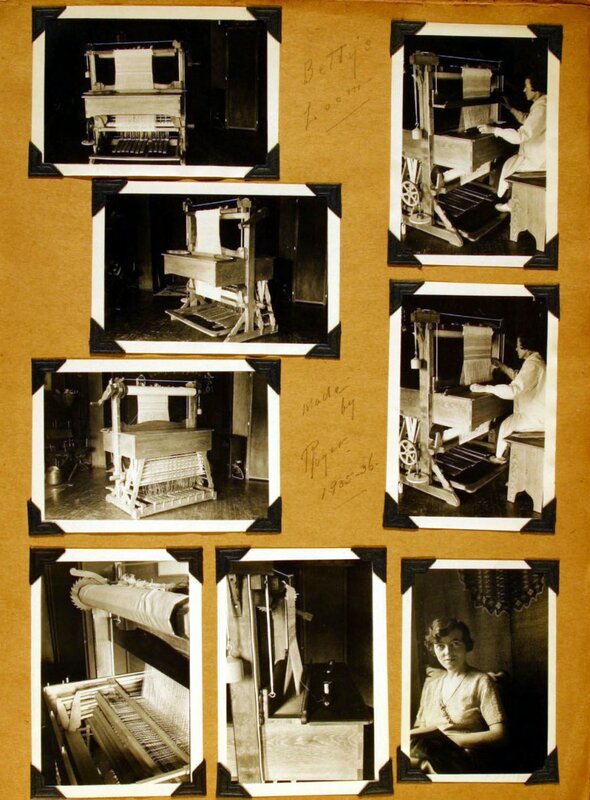 In the mid-1930s, Roger also studied, designed and built three weaving looms for Betty who had taken up original weaving for sale, specializing in modifications of Navajo patterns. Roger had also become interested in the variety of California woods, and started designing and carving jewelry. The Haywards would take these to local Pasadena craft shops and exhibitions for sale. As a result, they met and made friends with many more Caltech faculty. Many other activities occupied Roger during the down times of the Depression. He designed a nut cracker machine for the California Walnut Growers Association; he served as a consultant for the Unbreakable Lens Company of America; and he measuring basic physical properties of plastics. This all helped to keep food on the table during a difficult economic era. 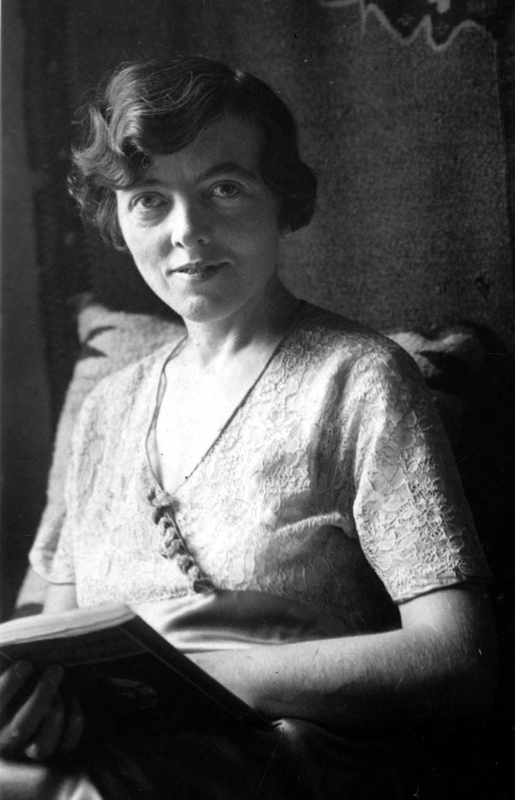 Roger also became a member of the Leslie Briggs Discussion Club, a study group founded in the 1930s to consider social and ethical issues including the impact of the Depression on the structure and well-being of families. This club featured a broad base of members — interestingly enough, many of them were from New England. The club’s membership strongly influenced on Roger’s thinking on a variety of socio-economic and metaphysical issues. Figure 15. 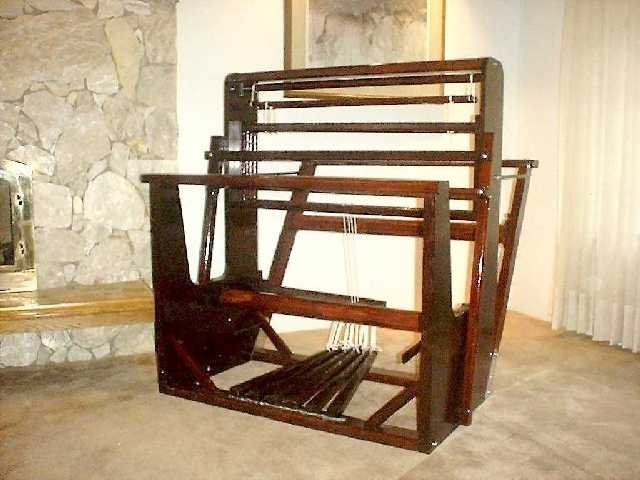 One of the looms designed and made by Roger for Betty. Another group with which Roger was intimately involved was the “100:1 Shot” or “10-2 Club.” This group, consisting again of a broadly-based membership (many from Caltech), delighted in the consideration of ideas that had only a small chance of actually becoming reality. Members of this group included G. Potapenko, G.A. Mitchell, R.M.Langer, H.V.Neher, John McMorris, John Strong, J.A. Anderson, M.L. Humason, J.T. Barkelew and R.W. Porter. The group met at a member’s home, and each member accepted the responsibility of setting the agenda on a suitable topic. A social hour normally ensued during which individual discussions on the topics at hand could be developed. In 1941, Betty and Roger moved to 920 Linda Vista in Pasadena, which would be their home until 1973. They planted special trees to produce stock for making jewelry and, more importantly, converted a two-car garage into their “hobbery,” containing a shop, looms, lathes and, of course, books and a drafting area. This “joint operations center” allowed Betty and Roger to work together on many different projects. Often one would read to the other from a classic novel while working in this environment. Obviously many ideas were conceived jointly in this setting. With the outbreak of World War II, Roger started work at the Mt. 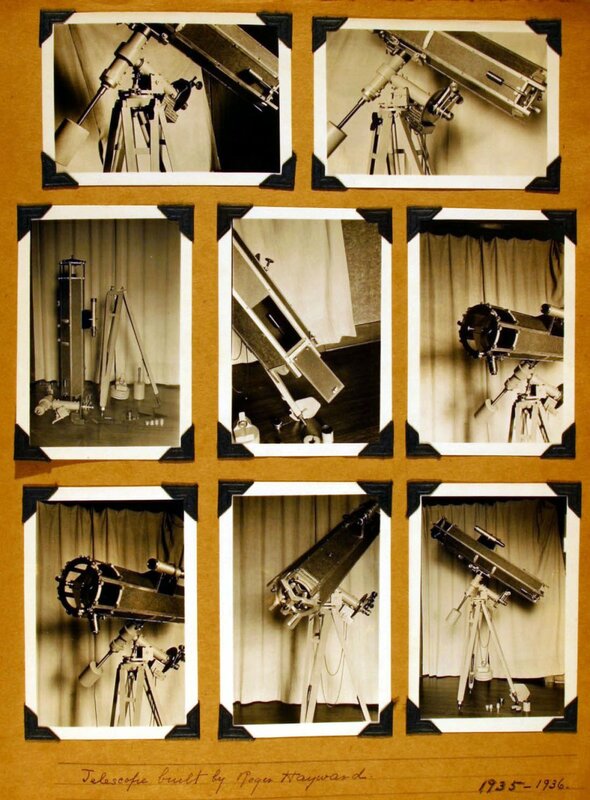 Wilson Observatory as an optical engineer. Here he developed the Schmidt-Cassegrain optical arrangement for telescopes, used for distant sighting of enemy planes. This work resulted in Roger’s attainment of four patents once secrecy restrictions were lifted at the end of the war (See Sky and Telescope, v. 114, no 3, p. 30-37) though, as it turned out, improvements in distant radar resulted in only limited application of the distant optical package. Roger also used his 3-D and optics knowledge to develop tools for air-to-air defensive gunnery, resulting in a number of practical publications for the Air Force on improvements in gunsight optics and the use of the Magnin mirror for gun sighting. As he said in 1943, “if the enemy had not run out of airplanes, we would have been on to a good thing.” Finally, Roger also was sent to North Africa to work directly with combat groups, where he developed an interest in North African art and archeology. The year 1946 marked the end of World War II and the start of new ventures. Roger continued as on in his role as an artist-consultant to the Division of Chemistry and Chemical Engineering at Caltech. He also collaborated with Linus Pauling in illustrating his General Chemistry, a project discussed between the two as early as the late 1930’s. In 1948, he illustrated Frantz’s Laboratory Study of Chemical Principles and Beadle’s Genes of Men and Molds. Roger also started to do more illustrations for Scientific American and, crucially, developed an association with the journal’s Amateur Scientist section. Scientific American emphasized the publishing of quality articles from well-know scientists, to which Roger contributed his considerable imagination and artistic skill. He also frequently contributed articles himself often on items that he had built himself in the hobbery. Indeed, Roger made sure that his scientific illustrations were not only beautiful but clear and correct, a point which will be considered further in our discussion (Parts 3 and 4) of the development of The Architecture of Molecules. In all of the above, it is important to realize that Roger did not illustrate anything until he understood the basic workings — so much so, in fact, that he built an opium pipe prior to creating the illustrations for Peter Fay’s The Opium War.